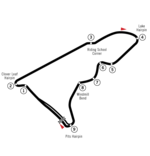 Locations of the circuits that hosted a Grand Prix. Nations that are scheduled to host a Grand Prix in 2019 are highlighted in green, with circuit locations marked in black. Former host nations are shown in dark grey. Former host circuits are marked with a white dot. Formula One, abbreviated to F1, is currently the highest class of open-wheeled auto racing defined by the Fédération Internationale de l'Automobile (FIA), motorsport's world governing body. The Formula One World Championship season consists of a series of races, known as Grands Prix, usually held on purpose-built circuits, and in a few cases on closed city streets. The results of each race are combined to determine two annual championships, one for drivers (World Drivers' Championship), and one for constructors (World Constructors' Championship). This list is for the circuits that hosted World Championship races from 1950 till now. The terms "Formula One race" and "World Championship race" were not always synonymous throughout history – see Formula One#Distinction between Formula One and World Championship races for a detailed explanation. The first World Championship Grand Prix was held in 1950 at Silverstone; since then 71 circuits have hosted a Grand Prix. A lot of classic (i.e. older) circuits have hosted Grands Prix using different configurations throughout their history: Nürburgring, Spa-Francorchamps, Monza, etc. 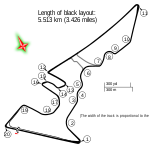 Taking Nürburgring as an example, the first World Championship race there used the 22.835 km (14.189 mi) configuration, but concerns over safety meant that more recent Grands Prix have used a shorter, safer circuit. F1 circuits were predominantly in Europe during the early years of the championship; as the sport has expanded, so has the location of its circuits. The expansion into Asia and America has been a recent occurrence. Of the 20 circuits that hosted a Grand Prix in 2012, nearly half were not on the calendar before 1999. The Autodromo Nazionale Monza has hosted the most World Championship races; the only season it did not host a race was in 1980, when the Italian Grand Prix was held at the Autodromo Enzo e Dino Ferrari. The Baku City Circuit became the 71st circuit to host a Grand Prix, when it held the European Grand Prix in 2016; this is the latest addition to this list. The longest circuit to have hosted a Grand Prix is the Pescara Circuit, which hosted the 1957 Pescara Grand Prix: the 25.800 km (16.031 mi) long circuit in Pescara, Italy, held the annual Coppa Acerbo race, and in 1957 it was the only time that this race was included as part of the World Championship, a race which Stirling Moss won. As some circuits have hosted Grands Prix using different configurations, the most recent configuration used is listed in the table below. The "Map" column shows a diagram of the latest configuration on current tracks and the last configuration used on past tracks. The "Type" column refers to the type of circuit: "street" is a circuit held on closed city streets, "road" refers to a mixture of public roads and a permanent track, and "race" is a permanent facility. The "Last length used" shows the track length for the configuration that was used last time the Formula One race was held on a given track. A. ^ From 1950 to 1960, the Indianapolis 500 was part of the World Championship. Hughes, Mark; Tremayne, David (2002). The Concise Encyclopedia of Formula 1. Parragon. pp. 70–93. ISBN 0-75258-766-8. "Circuits". ESPN. Retrieved 17 June 2012. ^ Gill, Pete (31 October 2011). "A truly global sport". Sky Sports. Archived from the original on 3 January 2012. Retrieved 18 June 2012. ^ "Facts and figures – Italian Grand Prix". Formula 1. 7 September 2006. Retrieved 22 June 2012. 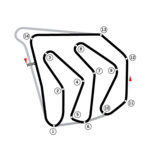 ^ "Pescara Circuit". ESPN. Retrieved 18 June 2012. ^ "United States Grand Prix history". Formula 1. 16 June 2004. Archived from the original on 30 September 2007. Retrieved 5 July 2012. This page was last edited on 16 April 2019, at 11:10 (UTC).